A new £97,000 play park in Dundee has welcomed its first visitors as it was officially opened. 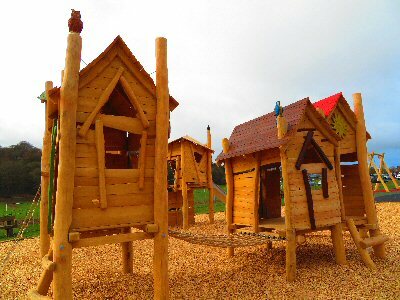 The facility at Lochee Park was designed to cater for children of all ages and abilities and to enhance and promote the park. Read the full article on The Courier's website. Only a small number of ticks are infected with the bacteria that cause Lyme disease. But it's still important to be aware of ticks and to safely remove them as soon as possible, just in case. Find factsheets and videos on the Foresty Commission Scotland website. Artificial and indoor ski slopes in Scotland provide an obvious stepping stone to Scotland’s ski resorts – and, then, potentially to travelling abroad to ski. Read more on Fiona Outdoors blog. A distinct "species" of brown trout that has never been reported before has been discovered in a Perthshire loch. The new species differs from the common form in having lighter skin, and a larger mouth and eyes. Read more on the BBC's website. A shocked squirrel has scooped the overall prize in this year's Comedy Wildlife Photography Awards. Other entrants included an exasperated bear, a smiley shark and a rhino appearing to wear a tutu. View the winning photos on the BBC's website.